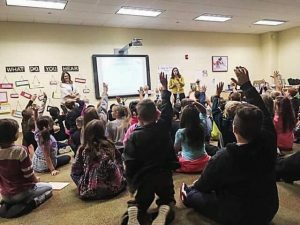 Western Wayne’s EverGreen Elementary School hosted the Lou Ruspi Jr. Foundation, (LRJ Foundation), on Friday, Oct.20 to talk to students in grades third to fifth about Mental health and Wellness. They also discussed ways students could take care of themselves and be good friends. Students learned and discussed skills that influence happiness along with social and emotional awareness to help build confidence and self-esteem. They also discussed mindfulness and using positive thoughts, words, and actions. Photo credits: From left, front row: Donovan Gregorski, Nevaeh Demming, Emma Bower, and Vincent Donnini. 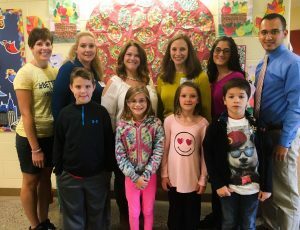 From left, second row: Mrs. Butler, health and physical education teacher; Carrie Chase, LRJ Foundation; Kelly Osborn, LRJ Foundation; Mandy Doria Ellard, LRJ Foundatoin; Mrs. Palko, School Counselor; and Justin Pidgeon, EverGreen Elementary School principal.